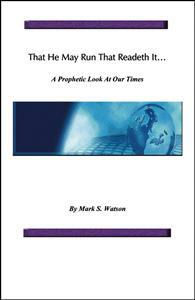 That He May Run that Readeth It is a challenge to Christian faith and obedience in our troubled times. It is a work primarily for Christians, though anyone can benefit from its message. It is a lucid diagnosis of the American National predicament and an exhortation to solid biblical Christian faith. This work pulls no punches, it will challenge many of our most cherished viewpoints and cause the reader to look at our times in a different light. Its hard-hitting style looks at the American church, political system and the mainstream media critically and without reserve. Mark, I haven't read your book yet. I just found your website and I wanted to thank you for all the work you've done to inform people what's actually happening. I wasn't able to email you so I'm posting my thanks here. I still have a lot to read but started yesterday with the economic data. I didn't realize the smoke and mirrors games started so long ago. Apparently very few people have any idea how bad things really are today. It's very scary! I've been referring people to your site and will continue to do so. Best wishes and thanks again!